Mr. Moses Steel, the mine owner, is very loosely based on Hugh Henshall Williamson the Burslem mine owner (above) who ran the Scotia Colliery and the Pinnox Colliery. He was also the man who sunk the first four shafts at Chatterley Whitfield. His mines were abandoned and flooded in 1869. This also affected the operation of the Bycars colliery. Another local colliery, Dale Hall Colliery, was abandoned in the early 1870s, again possibly due to the backwash from Williamson’s abandonment of his mines. In 1869 the Grange Colliery was only just opened, sited to the south of Burslem’s hill, and does not seem to have been affected by the flooding. Miss Merryweather Craft, inventor and town surgeon (above, picture courtesy of SoulStealer.co.uk). The Wolstanton inventor Oliver Lodge was a partial inspiration for Miss Craft. He apparently made one of the first practical local demonstrations of electricity as a boy, in 1868. Like Craft he was a science prodigy interested in electricity (in the novel called ‘electrikery’), and later helped to invent a key aspect of radio. Earth currents had indeed only just been discovered in 1869, and the aether or ether was then a current concept. He was much later interested in the ether, both as a scientist and via his interest in spiritualism and psychic research. There is a rather convoluted procession of experiments and locations, stretching across the Potteries, in Lodge’s youth. Lodge had apparently made the first local public demonstration of electricity in 1868 at Moreton House (probably in the barn or the barn-yard) on the southern tip of the Wolstanton Marsh, when aged about 16 or 17. Then, in his own words in his autobiography, “something like real experimentation” began for him around 1869, in a new home “electro-magnetic” laboratory at Chatterley House in Hanley. From 1870 he attended evening classes in Chemistry at Science and Art Dept. at the local Wedgwood Institute, Burslem, which led to his passing exams which allowed him to enrol in the University of London from which he graduated some years later. In 1875 the family moved again, this time to Watlands Hall and its estate at the north end of the Wolstanton Marsh, where Lodge experimented from 1875-80. A faun was a half-human and half-animal spirit of the woods and groves. The picture above is a self-portrait by the artist Johfra. Rousseau (above) wore this type of dress while living in the Staffordshire Moorlands, and did indeed go hunting herbs on the moors. 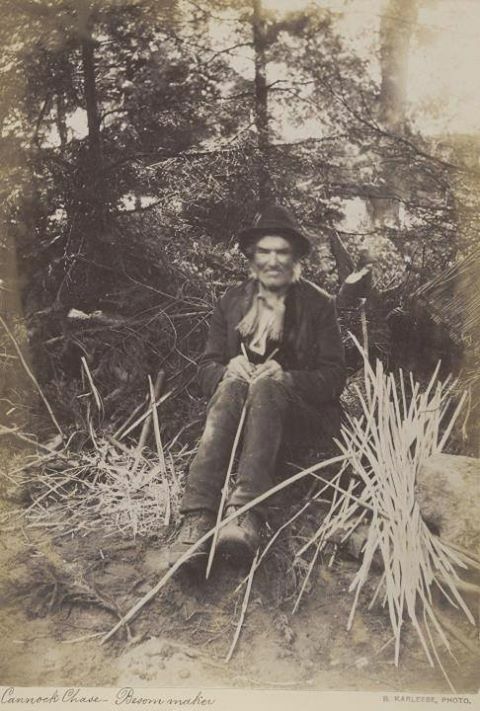 Besom maker, Cannock Chase, Staffordshire 1867. From the collections of Staffordshire Record Office. Not quite my character, but evocative of the sort of look. 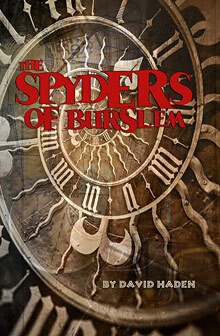 The novel imagines Mr Wedgwood living on into his 90s, and having moved from Etruria to Burslem.